What’s up fellas?! In today’s article and video, we’re gonna talk about the denim jacket and what a great addition it is to just about any wardrobe because of its versatility. Also guys, at the end of this article I have a question for you so please keep reading! To be honest, I haven’t necessarily been the biggest fan of the denim jacket growing up. They always felt uncomfortable to me because the fabric was always super stiff. Well today with advances in stretch fabrics, I’ve rediscovered the denim jacket. I found this one at American Eagle and I’ve been wearing it a lot lately. It’s super comfortable because of how stretchy it is, and I feel this light blue color is extremely versatile and looks great with tons of different items. I want to show you guys a couple different ways that you can style a denim jacket to make it go from dressed down to somewhat dressed up. 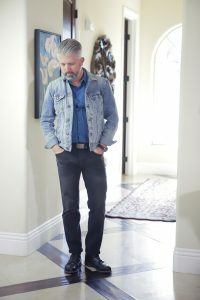 For this first look, I went with black denim jeans, black boots a dark blue shirt and of course the denim jacket. I like this look a lot I think it adds a lot of contrast because of the black denim and a lighter blue jacket. The black boots are some of my favorite boots from Wolverine. These are the “1000 Mile” boots and I love them. I’m wearing black a lot more now than I probably ever have, but maybe just because it’s fall and the temperatures are a little cooler. I think this outfit can take you from the day time to the evening really nicely. Okay, for the next outfit I went with double blue denim. So the trick here guys, is if you’re going with blue denim on blue denim, you’ve got to have some contrast. I’m going with the lighter denim jacket and darker denim for my jeans. I also went with some brown boots, a brown belt and a pattern shirt. It’s kind of a more rugged look but I think it’s pretty polished and pretty clean as well. This last outfit is probably my favorite way to wear a denim jacket and that’s with Chino’s. Chino’s come in so many different colors and pretty much every single color (at least that I own) goes perfectly with the denim jacket. So in this ouitfit I kept it casual with the black and white sneakers, but I elevated the look a little bit with a button-down white oxford and I layered with this black zippered V-neck sweater that I got from Express. I like this look a lot and I think it’s elevated in the sense that it’s still casual but also dressed up a little bit. Alright guys as promised I have a question for you. Please leave me a comment down below and let me know what type of content you would like to see from me. Don’t worry, I’ve got lots of ideas for upcoming videos and topics, but I want to make sure I’m hitting the mark for you, so please leave me a comment here or directly on my YouTube video and let me know what YOU would like me to talk about. Thank you and I’ll see you next week!